At Gossamer we are committed to helping your small business grow. Over the years we have helped our customers sell everything from a bottle of salad dressing to multi-million dollar homes. Key to success on the Internet is learning how to use it to help your business. The following information should be required reading for all business owners and should help you understand if the Internet is right for you. In addition, we highlight some of the services Gossamer supplies to help you with your ventures on the Internet. Some basic tips for those interested in adding Internet based advertising to their business plan. Covers the basics changes you can and should make to your marketing efforts. How much can you expect to save, or gain, from using Internet based services? Everyone should consider the advantages. Many have found that the effort results in increased productivity and/or cost savings. Our economy has been substantially changed with the productivity improvements common sense use of the Internet has afforded. Integration of the Internet with your business model needs to considered carefully. Having a fancy website may grab you bragging rights, but having a website that increases ROI is something you can laugh about to the bank. Having good search engine rankings can make or break your website budget. Attention to your search engine rankings is more important than ever as search engine popularity is on the rise. The basics are simple. Measure, Improve, and Track. Perhaps one of the least understood problems facing those contemplating building an online presence is the hype that those eager for your business will generously heap on you. The decision to build an online presence needs to make business sense. The first question you should answer is, "How will my web site help my business"? The first place you should look is at your company's redundant tasks, for example, are you constantly fielding requests for more information about your company to prospective clients? If so, you can immediately justify the expense of building a website based on the time you will save directing your new propsects to your website. Gossamer specializes in BSD dedicated servers using the rock solid foundation provided by the Open Source community. Our Apache2 hosting solutions are tried and tested and we believe they are the best in the industry. We actually use them! We normally prefer to host your web site on our own servers to save you time and money. We have streamlined the continued maintenance of your online presence by using the thousands of Open Source projects available including Perl, PHP, and Mono, applications that facilitate the design of more advanced web site features and projects like ClamAV and SpamAssassin, that provide the industry's best protection for our email server which eliminate all viruses and most SPAM. For the more advanced customer. When standard web forms and static pages are not enough. You may need some custom programming to help you better qualify leads, add some interactivity to your web site, or integrate your web site with your back office. Got that specialty item you like to sell more of? Perhaps the Internet can help. Options abound, from EBay to Yahoo!. Let us help you sort out the options. The big issue for most, is adding Internet credit card processing to their back office operations. Let us help you match your back office operations with your choice of Internet E-Commerce solutions. 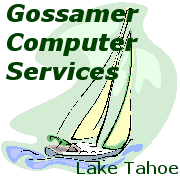 A few of Gossamer's web designs may be found on Dream Lake Tahoe!